Carol Carter is a longtime resident of St. Louis, where she earned a Master of Fine Arts degree from Washington University. Long admired in the St. Louis area, she earned national recognition in 2002 when her work was featured on the cover of New American Paintings magazine. She stepped onto the international arts stage in 2002 with a solo exhibition in Guayaquil, Ecuador, sponsored by the U.S. Embassy. She has had solo exhibitions in Norway, France, and USVI. She was AIRE fellow- Everglades National Park in 2010. Crate & Barrel and Verizon Wireless recently added her to their collections. Carol’s paintings have been included in many national exhibitions and are in private collection in the US. She will be featured in Watercolor Artist, Fall 2016. She is currently working on a collabrative exhibition with the St. Louis Zoo on endangered animals entitled IN DANGER. Carol is in demand to teach workshops on watercolor around the country. She travels abroad to exhibit and teach as well. 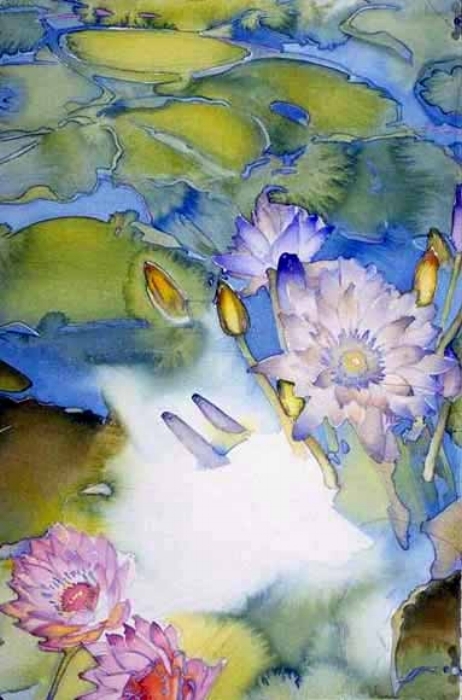 Water is an enduring presence in Carol Carter’s watercolor and acrylic paintings. Having grown up in Florida, she sees water as an evocative backdrop, resonant in contrasts that illuminate the human condition. Using vibrant, saturated colors, she plays upon the dualities present in nature in images of swimmers, lush landscapes, insightful portraits and botanical studies. REGISTER for the Carol Carter Watercolor Workshop (Folsom CA) by submitting the fill-out form below. Cancellations before May 12, 2017 will be refunded minus $50 administration fee. No refunds after May 12, 2017. Exception: if we have someone on a wait list or you can provide your own replacement.